This recipe was first published in June 2011. Updated on September 2017 with new images and description. 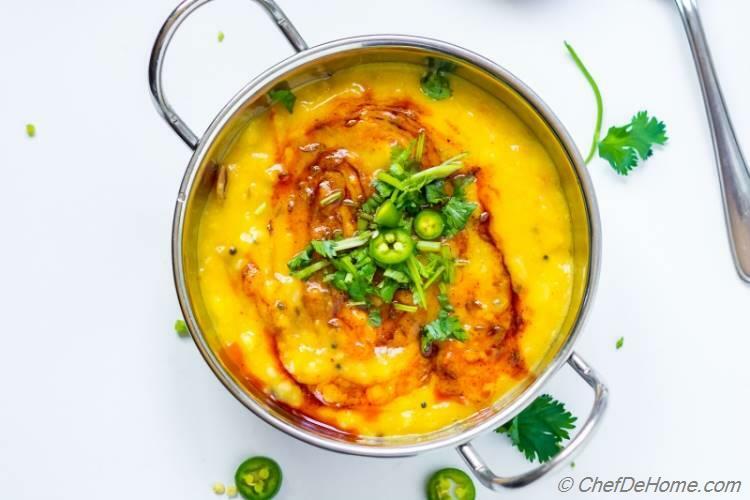 A simple, healthy split yellow lentil (daal) recipe prepared with aromatics, seasoned with tomatoes and garlic, and flavored with spiced oil known as Tadka. A simple, quick, and perfect meatless Monday meal with side of steamed rice. This classic lentils recipe never gets old. It freezes well, is gluten free, vegan, and has potential to load-up with any seasonal veggies in-hand. 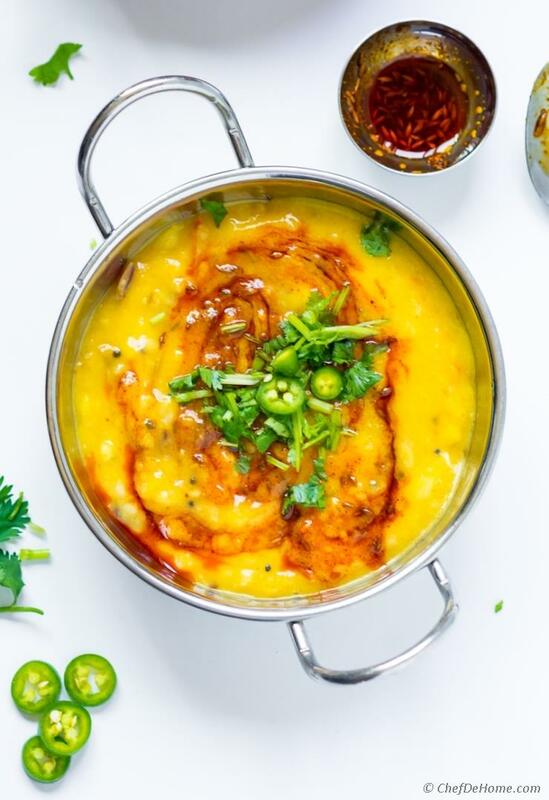 Yellow Daal with Tadka (tempered spiced oil) is most humble lentil preparation and an every day recipe in every Indian household. Every region has their own version of this lentil stew. My recipe is most common in Northern region. 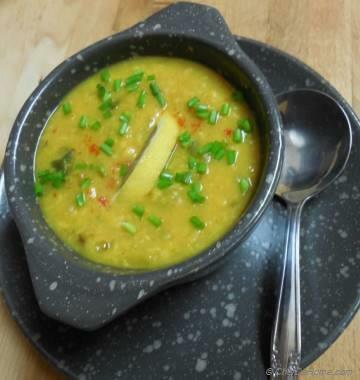 Over time, my lentil Tadka recipe has grown as my taste and love for food has grown.. These days, I prepare it various ways depending upon the season and mood. Initially, I had planned to share another version of this Lentils today but felt.. I cannot do justice with new recipe until I revive my old post. 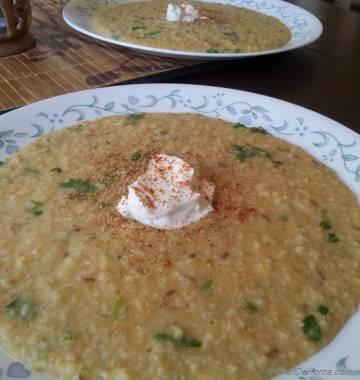 I still plan to share the few other favorite versions of Daal Tadka. Check back soon. I will update all my shares here. Like I said, this simple dish can also be served as a spiced soup. Serve bread to scoop the daal and splash of lemon juice to cut balance the flavor of spices. Even today, whenever I prepare Daal Tadka for dinner.. I save some leftovers for lunch. For lunch, I thin-out the daal with some water or vegetable stock, taste and adjust seasoning, warm it up, add splash of lemon juice. This easy step turns it into a lentil soup. 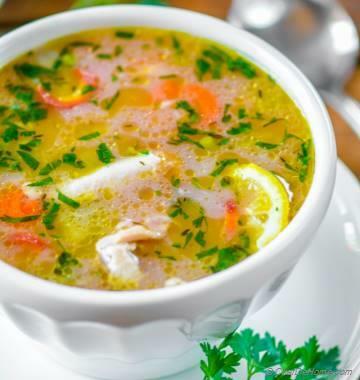 A side of warm bread and this soup feels like a most comforting easy meal ever! 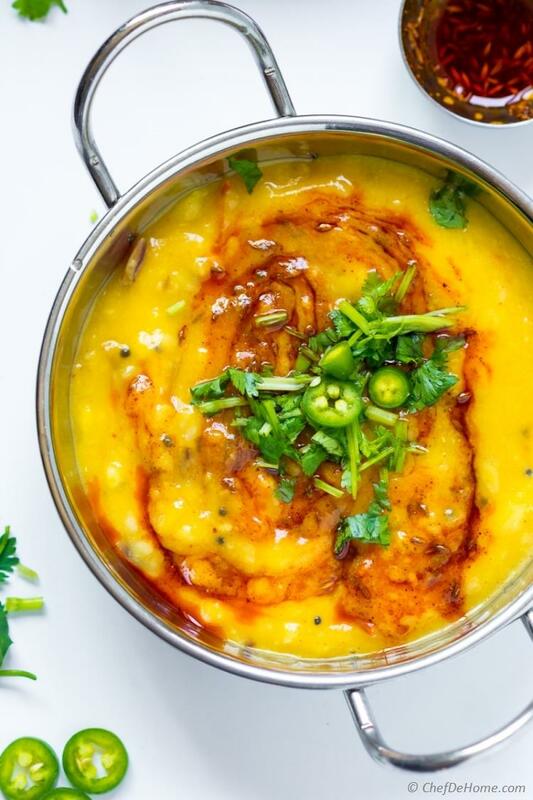 Make Ahead: Daal Tadka can be prepared 1-2 days in advance. It gets thick as it sits for long which can be fixed while re-heating the daal. Simply dilute with water and adjust seasonings (if needed). Reheat and enjoy! All lentils are gluten free. So is this daal recipe. It is also nut free and vegan. 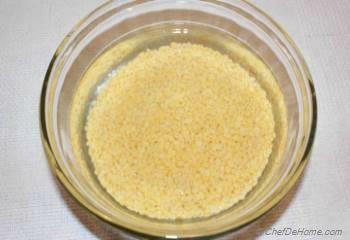 In traditional preparation, clarified butter (called Ghee) is used to instead of oil for tempering. I like to only use oil and no butter which makes this recipe vegan and lighter. I recommend loading daal with seasonal veggies such as small diced carrots, zucchini, or cauliflower. Boil with lentils for more flavor. Make it a loaded veggie and protein-full meatless weeknight dinner. If prefer, serve with rice, bread, or naan. Or a green citurs salad goes great as well. No matter how you serve.. One thing is certain! You will fall in LOVE with the flavors and simplicity of this dish! 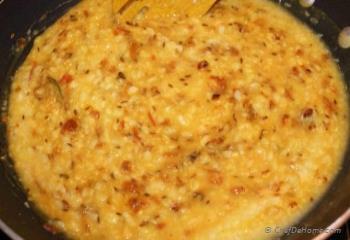 PS: Yellow Daal Tadka recipe was first published in June 2011. Today, I have updated the pictures, and added more explanation in method of preparation. Total Time 35 minutes Prep Time 10 minutes Cook Time 25 minutes Difficulty Easy Yields 4 of 1 Cup Servings Serves 4 Notes No. of servings depends on serving size. 1. Wash lentils in running water until water runs clear. 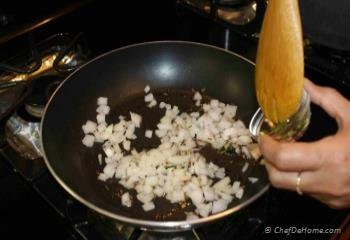 Then boil with 3 cups of fresh batch of water and 1/2 tsp salt until lentils are very tender or done to your preference. (15-20 minutes). Boil on low-medium heat as yellow lentils tend to boil-over very quickly. To cook lentils in *Pressure Cooker, follow instruction in notes. 2. Heat 1 tablespoon of oil in pan, add half of cumin seeds (these should start sputtering), add onion and fry until light brown in color (4-5 minutes). Now, add ginger, garlic, green chilies. Fry for 2 minutes. 3. Now add grated tomatoes and fry until oil separates. Add turmeric and half teaspoon of red chili powder and fry for 30 seconds. 4. Mix daal/lentils in the fried mixture. Cook for 1-2 minute at low heat. 5. Turn off the heat. Remove lentils in a bowl. Whip the pan clean, heat up remaining oil. 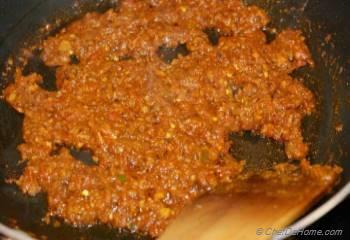 When oil is hot, add in cumin seeds and remaining chili powder. Fry for 20 seconds then pour over daal. Garnish with chopped cilantro. Serve hot. Enjoy! Pressure Cooker: If using pressure cooker, cook lentils with 2.5 cups of water and 1/2 tsp salt for 4-5 minutes. Or check instructions on your Pressure Cooker for lentil cooking time. Allow the steam to escape before opening the lid. 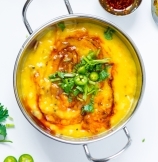 Make-Ahead: To save time prepare Yellow Daal Tadka on weekend and freeze it for upto 1 week. Re-heat and enjoy anytime. Love this recipe. I've made it several times. I've substituted other lentils/legumes when I'm out of moong daal, and it still comes out great. Just adjust the water level for cooking the particular type of lentil. Kerry, thanks for sharing your experience with us. I'm glad you enjoying daal. I totally agree, you can use any lentils and this cooking method for great tasting daal. Thanks for this, going to give it a try tonight. Looks great. Thanks Luke for trying recipe. I hope you enjoy! I tried this recipe and tastes just awesome. I also recommend everyone to try this recipe at least one time you will love it. Thanks for sharing such awesome recipe. Millie. thanks for stopping by.